Friday 1st / Karl Drinkwater's site: this Welcome post. Saturday 2nd / Grab This Book: a creepy Q&A with me where I reveal something that happened to me in 1988; also a cracking review in another post. Sunday 10th / Linda's Book Bag: I was challenged to argue the case for why people should read horror. Result: I succeeded, Linda was persuaded to read my book, and the post includes a glowing review. Thursday 14th / Life of A Nerdish Mum: a post about one of my stories, and a Q&A with me about my writing. 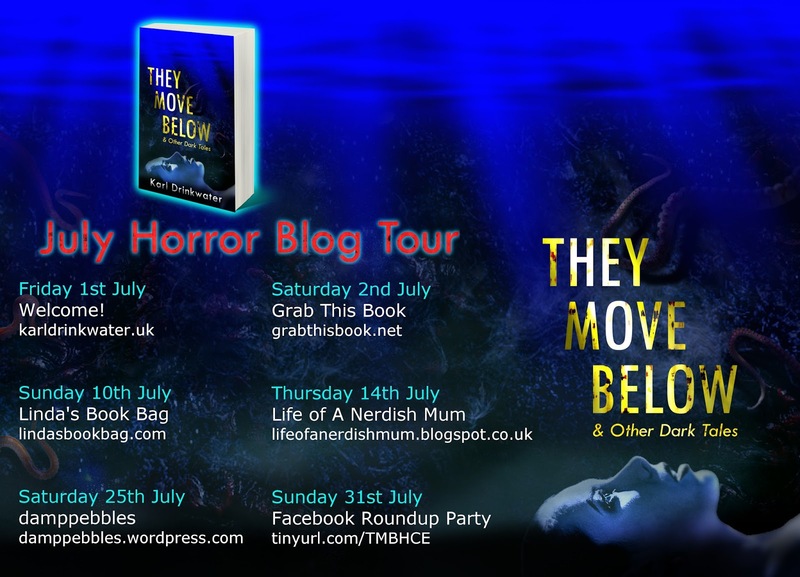 Saturday 25th / damppebbles: a review of They Move Below, plus an article about how depression has fuelled and interacted with my writing. At some point on each day a post related to They Move Below will go up on the indicated website - in most cases the blogger's thoughts on They Move Below (which will be a surprise to me, because I haven't been told what they will say in advance!) and a contribution by me, such as a small article on a topic, or a Q&A. While you're there have a look around - each blog is packed with reviews and other information, so you might find some other great books to read. Hopefully a blog tour like this benefits everyone. I get exposure for my new labour of love; the blogs gain new readers; book readers find out about other books they might be interested in, and insights into my own work or creative process. I've had a piece of good news this week - IngramSpark has entered They Move Below into the British Book Design and Production Awards. I'm so pleased! Working with IngramSpark has been a pleasure all round. One of the stories from They Move Below is also available as a standalone release - Harvest Festival. A fast-paced novella based on the premise: how would you protect your family if you woke in the night to find a terrible threat had arrived at your isolated farmhouse? Harvest Festival makes a great introduction to my recent work, and also a cheap present for someone (hint hint). As with all my books, it is available in print and electronic formats. Lastly, I have a publishing imprint called Organic Apocalypse. This year my existing books will get a lick of polish and be re-released with new ISBNs, probably new covers, minor interior edits etc. Organic Apocalypse is also the name of the practice band I play in with my friends. Thanks for sticking with me, hopefully see you at the various stops of the blog tour! Feel free to say hi below. Have you read any of my books? Will you be visiting any of the sites? What do you like to read?